When the serving British Prime Minister David Cameron used the words, ‘Unjustified and unjustifiable’ to describe the British army’s actions on Bloody Sunday, those three words allied with The Bloody Sunday Inquiry’s own finding on the same day (15th June 2010), that all of those killed and injured were completely innocent, represented for many, the high-water mark of the campaign. There is no doubting that in realising two of the Bloody Sunday Justice Campaign’s three demands it marked an enormous achievement in the campaign so in late December 2010 as we approached the 39th anniversary, a public debate was initiated by the announcement of the Bloody Sunday Trust that following year’s anniversary march on 30 January 2011 would be the last. While it initially sounded as if the families and the Weekend Organising Committee were of one voice on this, it soon emerged that there was a diversity of opinion within the families, the wider campaign and the city as to whether or not the annual Bloody Sunday March should continue into the future. Those who felt the march should end argued that June 15th 2010 represented victory for the campaign. They felt it marked the point when the campaign should move from a broad based civic society one, galvanised each year by the march to a private legal one that was best left to the DPP, the families and their legal representatives. Those who held the alternative view felt the march should continue at the very least until those responsible for the murder of their loved ones where held to account. This is in fact the third of the three original demands of the campaign. The strength of opinion behind this view was dramatised when Kate and Linda Nash left the Bloody Sunday Trust’s scheduled route of the march to Guildhall Square and turned right at Roseville Street. A significant section of those marching decided to follow them. They stopped at Free Derry Corner where Kate declared that they would organise the annual march the following year. Kate and Linda’s brother Willie Nash was murdered on Bloody Sunday. Their father Alex was also shot and wounded. He had been trying to go to the aid of his fatally wounded son at the time. As a result of the above when last year’s 40th anniversary march did take place, it was in an atmosphere of considerable controversy within the community. Its theme was March For Justice. It was organised by Kate and Linda together with their friend Helen Deery and the support of others in the city and beyond. Helen’s 15-year-old brother Manus Deery was shot dead by the British army in May 1972. More than 5000 took part. Liam Wray whose brother Jim was shot dead on Bloody Sunday, addressed the crowd alongside Kate. They each reaffirmed the civil rights/human rights ethos of the march and that it should be maintained as the national/international platform it had become to speak out not just about Bloody Sunday but other human rights issues here and across the world. They declared that they would march again and continue to march each year and made a public appeal from the platform for those interested in helping to organise subsequent marches to contact them. Those people have come together to form the Bloody Sunday March Committee and agree the ethos within which the march and surrounding events will be taken forward each year. In keeping with the aspirations of the original civil rights movement and the spirit of successive Bloody Sunday commemorations, the march and programme of events for 2014 will act as an inclusive platform for the many seemingly disparate campaigns that concern the people of these islands and beyond. As in previous years it will be a moment to come together, make connections and raise our issues and voices in debate and solidarity. We are living in a time when ordinary people are being coerced by government and corporate institutions. A time when our natural resources are being systemically ravaged and exploited by multi-nationals for the benefit of the few. A time when the values of accountants and bankers dictate how we all live our lives, and it’s us who are being made to pay the bill for their greed, while they continue to grab more and more. Throughout Ireland and Britain working people and those struggling to find work are being harassed by employers who seize the opportunity to roll back equality and fairness in pursuit of greater profit. Everything is calculated, costed and measured by ‘the market’, and it says ordinary people’s lives and concerns don’t matter! We see the old tactic of divide and rule diverting anger & frustration into sectarian, racist and sexist support for demands to drive somebody out of somewhere. Now, more than ever, we need to make common cause with all those struggling for justice in its many aspects. Against this backdrop of right wing policies and so called ‘austerity’, the unresolved justice questions of our past continue to make the headlines. Many long years after their loved ones were taken from them, relatives and friends still calling for truth and justice are increasingly being met with counter voices saying: no to investigations, no to prosecutions and no to inquiries and inquests. Through its surrogates the state tells us we as a society need to move on. Justice and accountability for past events is considered to be too expensive and we are told: we can’t afford justice for the dead, think only of the living. Those who challenge that view are systematically isolated, alienated and even demonised. Events then shift to the Nerve Centre where film screenings will explore amongst other things, the British Army’s ‘Military Reaction Force’, a secret terrorist unit operating in Belfast in 1973 (Thur 30th). Then on Friday evening (31st), Professor of criminology at Queens University Phil Scraton will deliver a talk on the extent of the British state’s coverup of responsibility for the Hillsborough Football Stadium disaster (Sheffield 1989). 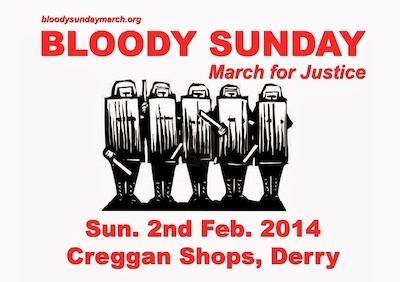 The march will assemble on Sunday 2nd Feb. at 2.30pm at the Creggan shops, Central Drive. Check out www.bloodysundaymarch.org for further details as they become available.